William R. Polk was a professor of history at the University of Chicago. During the Kennedy and part of the Johnson administrations, he was the member of the Policy Planning Council responsible for North Africa, the Middle East and Central Asia. His latest book is Crusade and Jihad: The Thousand-Year War Between the Muslim World and the Global North (Yale University Press, 2018). Professor Polk circulated this letter after the release of the report, "Stabilization: Lessons from the U.S. Experience in Afghanistan." 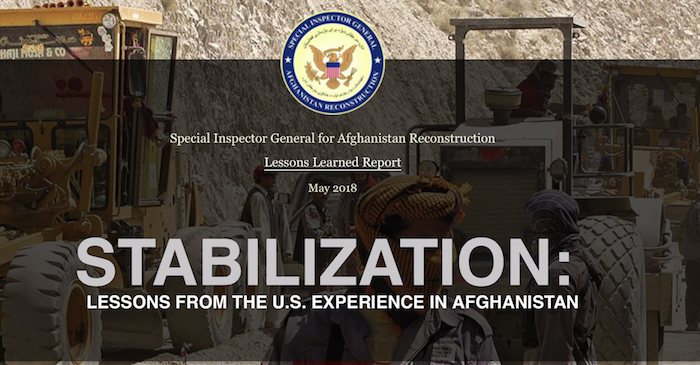 This is the official finding of the organization that the Congress established to monitor the American intervention and occupation of Afghanistan. For those who remember Vietnam, the report sounds familiar. Neither Democrats nor Republicans, neither Clinton nor Bush, neither Obama nor Trump heeded that wise advice. So we all, Afghans and Americans, are paying for their failures. The costs have been horrificm no matter what scale is used to measure them. It is terrible now and looks like it will get worse. So far it has cost the Afghans a generation of children, large numbers of whom are now stunted — that is, deprived of their full physical and mental growth. Casualties are really only guesses but they certainly run into numbers that, if compared by population size to America, would have wiped out the New England states. Displaced from their homes or even driven out of the country are numbers that, again proportionally,amount to something like the population of Texas. Bad as these are, they are made far worse by the destruction of civic life. That has amounted to something never experienced in America. It can be thought of if we imagine that all the schools, hospitals, courts, police departments, social services, local, state and federal governments in America ceased to function. In Afghanistan they did. It has not been so bad for us: Just a few thousand killed but hundreds of thousands wounded either physically or mentally. About $3,000 to $4,000 wasted for each of us. As President Eisenhower would have put it, the $3 to $4 trillion should be thought of in terms of bridges not repaired, schools not built, hospitals not created, cities not refurbished. America could truly have been made “great again” with what was there simply wasted. And, like Vietnam, policies pursued have brought about and fueled bitter divisions in our society and cheapened our very means of discussing with one another. The very questions seem insulting to our good sense. I first travelled around Afghanistan as a US official in 1962. Everywhere I went, I was welcomed. Never was I in danger. The Afghans were poor, but they lived together in reasonable security and in their own homes. In analyzing American policy, my then assignment, I concluded (my report is still available) that we had little direct national interest there, that the important thing was that the Afghans work out their own destiny with occasional and limited assistance (such as small, cheap and marginal assistance in such things as farm-to-market roads). Instead, we had gone for showy, expensive and impractical projects which, worse, appeared to have been aimed at the Soviet Union. That is, we were trying to use Afghanistan as a base for the Cold War. Predictably, if stupidly or at least unnecessarily, the Communists, both Afghans and Soviets, reacted. The Afghans were an incompetent bunch and, to save them and ward off what they viewed as the American threat, the Russians invaded. In ten years of occupation, they began the wreck of the country and did wreck their own state. That is more or less where we jumped in. Now, the only sensible course of action is to jump out. Getting out will not be easy. We have literally built ourselves into the landscape. We have destroyed much. And we have, as the only independent but official US government organization, the Inspectorate General for Afghan Relief, points out, we have apparently virtually totally corrupted those on “our” side. They will flee the country at the first sign we might cut back. Most have already amassed great fortunes (of our aid money) and are literally “foot loose and fancy free.” They not only will stand and fight, but we will hardly catch a glimpse of their backsides as they hightail it for Dubai and other safe havens. Vietnam redux. Permit me a Vietnam comparison: in the continuing argument I had with my then boss, Walt Rostow (who arguably was the architect of our policy in Vietnam), I challenged him, saying that the only hope we had in “winning” was to prevent the corrupt South Vietnam leadership from smuggling (our) money out to black bank accounts. He replied that such a move was impossible. So I put it to him in front of the Policy Planning Council that he had lost. He could not — never could — admit that. Our defeat was the obvious part of the Vietnam story. What was not obvious was what happened next: Having got rid of the corruption of the south, the “north” mellowed. So today, Vietnam is a relatively secure, prosperous and even friendly state. Comparison to Afghanistan? Not precise, but suggestive. If the thugs, warlords and corrupt politicians of the South are replaced by almost anyone, the chances for a Vietnam outcome improve. Without that change, there is no hope. And no hope will translate into endless war, endless misery, endless cost. Which do we want? I know about me. What about you?